These articles were written for older Macs, running older versions of OS X and Parallels and are now out-of-date for current hardware, operating systems, and applications. If you have a new Mac or are considering switching to Mac please see the NEW article in the TMG 9 forum. This topic is intended to gather in one place articles specific to using TMG 8 on an Intel Processor based Apple Macintosh computer. Boot Camp - A free utility included with recent Mac operating systems that creates a dual boot configuration which allows the user to install another operating system, in effect two separate computers. Virtualization - Mac software that allows the user to create a virtual machine and install another operating system, in effect two computers running simultaneously. These methods require the installation of a Window Operating System; you will need Windows installation disks and an activation key. In addition to Windows you also need to install Windows anti-virus software. There are a growing number of TMG users that are making the switch to Mac, hopefully these articles will be of use in resolving some of the technical issues involved. This article does not cover installing Parallels, setting up a Virtual Machine and installing a Windows Operating System; it is assumed you have already done this and your Windows virtual machine is running properly. Replace username with your Windows user name. Before you install TMG in a virtual machine it is recommended that you read the help topic: Customizing Data File Storage. Help > Index [tab] > Data File Storage - For Advanced Users > in Data File Storage for Advanced Users – Locate the section Customizing Data File Storage, there is one sentence: “If you would like to change the Program Default Data Paths, see Customizing Data File Storage.” Click Customizing Data File Storage to see the help topic. It starts out with “This topic is for Advanced Users…” while you may not consider yourself an Advanced User, running TMG in a virtual machine is an advanced use of your Mac and TMG. Your data files are available to both operating systems. Your data files are available when the virtual machine is not running. You don’t have to manage data files in two locations. Automated backup of your data with Time Machine. The implication of this is when TMG runs for the first time after installation it creates a number of folders and files in the Mac Documents folder. The existence of the TMG folders and files in the Mac Documents folder is not in itself a problem, the problem is TMG Project files located in the Mac file system. TMG may run and you might be able to open a project, however you will more than likely encounter many error messages and extremely slow performance. It is also possible some project files may become corrupted. TMG project files MUST be located in the Windows file system! There are a number of options. At a minimum you can change the sharing configuration in Parallels so the Mac Documents folder is not shared with Windows, not share any of the Mac user folders with Windows, or choose to completely isolate Mac from Windows. In my opinion none of these is desirable as they reduce functionality and limit the ability to take advantage of both operating systems and require the user to maintain data files in two locations. Unfortunately TMG has problems with project files stored in the Mac file system; luckily TMG has a method for locating projects and auxiliary files in other folders that we can use to solve the problem. Create the data_paths.txt file after you install TMG and before you run it for the first time. Username is the user name for your Windows account; you may find this on the Windows start menu or in Control Panel - User Accounts. DO NOT create the data_paths.txt file with Mac’s TextEdit, TextEdit creates rich text files (.rtf) and the data_paths.txt file needs to be a plain text file. The effect of the data_paths.txt file is to redirect TMG back to the Windows Documents or My Documents folder. TMG will create the necessary folders. You have to remember when navigating to your TMG Project files you can’t get there from the Documents or My Documents button on the Windows start menu, instead you will need to start with Computer or My Computer then Drive C and navigate to the folder depending on the operating system you are running. Windows Vista & later users confused about Documents & My Documents see the Junction Points article. It has been my experience that .sqz files can be successfully restored from a folder located in the Mac file system, however if you encounter problems copy the file to the Windows side. TMG creates a Backups folder under My Documents\The Master Genealogist v8 copy the .sqz file to that folder and restore from there. For the first restore I’d recommend restoring only the project, not customizations and not external exhibits. In Step 2 of the restore wizard enable [check] Use the default path for external exhibits, later in the wizard, Step 4, you can disable [uncheck] External exhibits. In Step 3 enable [check] Use the default path for configuration files and Use the default path for timeline files. We want all TMG’s auxiliary files located in the Windows file system. When restoring customizations it may take a number of attempts to get it right. If you are using TMG on two computers, say Windows XP desktop PC and Windows 7 in a Parallels virtual machine on a Mac you’ll want to check the paths in TMG preferences after you do a restore. You may save your TMG Backup files (.sqz) to the Mac Documents folder, if you use Time Machine they will be automatically backed up. Create a TMG Backup folder in your Mac Documents using Finder, I named mine TMG_Backups. In TMG Preferences – Current Project Options – Advanced change Backups to this folder using the ellipsis browse button […] at the right end of the text box (always use the browse button – never try to type the path). I have successfully restored .sqz files from the backup folder located in the Mac file system. If you encounter a problem copy the .sqz file to the Windows side and restore from there. You may locate your Exhibit files in the Mac file system. I have tested this with .jpg, .png, .pdf, .doc, .rtf and .txt file types. Again if you use Time Machine your exhibit files will be automatically backed up and you will be able to use Mac programs to edit and manipulate images and files and they will be accessible when the virtual machine is not running. Since most of my exhibits are images I created a Genealogy folder in my Mac Pictures folder, I also created several sub-folders including an alternate images folder for use with Second Site. Following the procedure described above for Backups to set your Exhibit folder path to the folder in the Mac file system. My Exhibits folder path is: Y:\Pictures\Genealogy. You will not be able to specify a path starting with \\psf in the Validate File Integrity – External Exhibits search for missing external exhibits folder list; therefore you should use the add button in the Exhibit Log and navigate to the file to select it, the resulting path to the file will be Y:\Pictures\Genealogy\People\file.png – since the path starts with a drive letter it can be added to the folders to search list in VFI Search for missing exhibits. The TMG output to word processing module has problems creating reports in the Mac file system, TMG will return a Conversion error #14: Could not create destination file; therefore you must save the files in the Windows file system, use the default report output folder. In version 6 of Parallels, if you have Word 2008 for Mac installed and your Mac Applications are shared with Windows you should be able to open word processing reports when they are generated. If you are using an earlier version of Parallels you cannot open the report directly from TMG, you will have to navigate to the report output folder and open it with Word 2008 for Mac. Output to Word for Windows 2000 or later is not compatible with iWork Pages, use Rich Text Format (RTF), TMG will not open Pages. To have your reports available when the virtual machine is not running and have them backed up with Time Machine save, copy or move them to the Mac Documents folder. You ran TMG and your TMG data folders are located in the Mac Documents folder. If it runs at all you are getting error messages and TMG is VERY SLOW. Not to worry, I’ve been there and done that. The first time because I didn’t know any better and I’ve also done it intentionally. Simply close TMG and create a data_paths.txt file as described above, when you restart TMG you may have to reenter your registration data, however TMG will create the necessary folders and files in the Windows documents folder. You can either restore from backup to the projects folder in the Windows file system or you may be able to copy ALL the files in the project folder on the Mac side to the Windows folder. I’d recommend restoring a backup over attempting to manually copy files. Once you are satisfied TMG is running normally and you have your projects and customizations backed up you can send the folders and files in the Mac Documents folder to the Trash Bin. Use the browse ellipsis […] button to specify paths in TMG Preferences ~ never attempt to key in the path. KISS – keep it simple – use the defaults for most all TMG paths with exception of Backups and Exhibits. Manage external exhibits outside TMG, use other utilities like Time Machine for backup and restore. Use File – Maintenance – Validate File Integrity – External Exhibits – Search for missing external exhibits to reconnect external exhibits. Remember when looking for your TMG projects navigate from My Computer to Drive C to either Users or Documents and Settings and drill down to the project folder. If you routinely move projects between two computers you will become familiar with the process develop custom backup and restore configurations on each machine. Keep OS X, Parallels, and Windows updated at all times. GlennA is the Windows Users account for normal day to day use. Admin is the Administrator account used to install software and maintain the Windows virtual machine. If you don’t plan to run TMG in an Admin account it doesn’t need to be setup in the data_paths.txt file. For those who are installing Vista or later in your virtual machine and have used Windows XP you may be confused about the path specification in the data_paths.txt file. 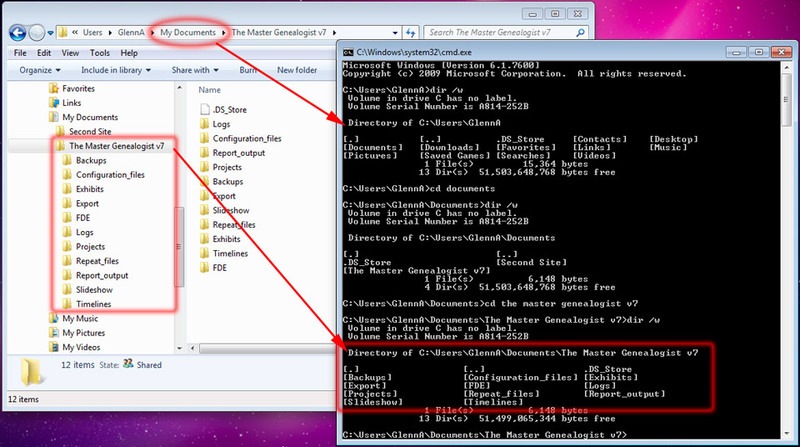 When you navigate through the Windows file system you see “My Documents” but the help topic Customizing Data Storage specifies: UserData=C:\Users\username\Documents\The Master Genealogist v8. The path should be as shown in the help file. The My Documents folder you are seeing is a Junction Point, the real folder is Documents. If you navigate to the Users folder from the command line you will not find a My Documents folder. A discussion on Junction Points is outside the scope of this article. Microsoft Support - Error message when you try to access the My Documents, My Music, My Pictures, and My Videos folders in Windows Vista: "Access is Denied"
Also, if using Parallels, see this alternative approach recommended by John Cardinal. This topic is still in development. If you want to contribute to this topic, please contact Glenn and coordinate with him. Please do not respond to this pinned topic. Any responses will be removed. If you have problems or questions running about TMG8 on a Mac, either start a new topic or add to an appropriate existing topic (other than this one).